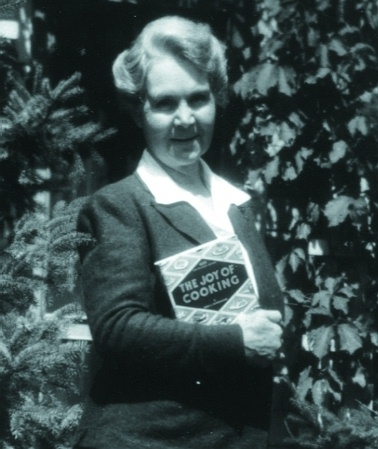 In 1931, Irma Rombauer announced that she intended to turn her personal collection of recipes and cooking techniques into a cookbook. Cooking could no longer remain a private passion for Irma. She had recently been widowed and needed to find a way to support her family. Irma was a celebrated St. Louis hostess who sensed that she was not alone in her need for a no-nonsense, practical resource in the kitchen. So, mustering what assets she had, she self-published The Joy of Cooking: A Compilation of Reliable Recipes with a Casual Culinary Chat. Out of these unlikely circumstances was born the most authoritative cookbook in America, the book your grandmother and mother probably learned to cook from. To date it has sold more than 15 million copies. This is a perfect facsimile of that original 1931 edition. It is your chance to see where it all began. These pages amply reveal why The Joy of Cooking has become a legacy of learning and pleasure for generations of users. Irma's sensible, fearless approach to cooking and her reassuring voice offer both novice and experienced cooks everything they need to produce a crackling crust on roasts and bake the perfect cake. All the old classics are here -- Chicken a la King, Molded Cranberry Nut Salad, and Charlotte Russe to name a few -- but so are dozens of unexpected recipes such as Risotto and Roasted Spanish Onions, dishes that seem right at home on our tables today. Whether she's discussing the colorful personality of her cook Marguerite, whose Cheese Custard Pie was not to be missed, or asserting that the average woman's breakfast was "probably fruit, dry toast, and a beverage" while the average man's was "fruit, cereal, eggs with ham or bacon, hot bread, and a beverage," the distinctive era in which Irma lived comes through loud and clear in every line. Enter a time when such dishes as Shrimp Wiggle and Cottage Pudding routinely appeared on tables across America. The book is illustrated with the silhouette cutouts created by Irma's daughter Marion, who eventually wrote later editions of The Joy of Cooking. 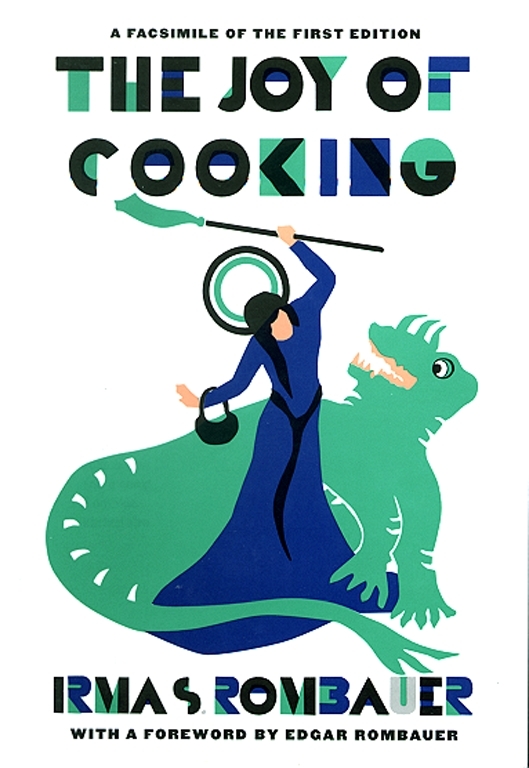 Marion also created the cover art depicting St. Martha of Bethany, the patron saint of cooking, slaying the dragon of kitchen drudgery. This special facsimile edition contains both Irma's original introduction and a completely new foreword by her son Edgar Rombauer, whose vivid memories bring Irma's kitchen alive for us all today. Apricot or other fruit syrup to sweeten and flavor the cocktail as desired. These proportions may be varied. Serve the cocktail iced, with hot Cream Cheese Canapés -- Page 6, or with some other appetizer -- or prepare 1/4 cup of cocktail for each person, chill it in the refrigerator and pour it over skinned, chilled and slightly sweetened grapefruit sections, in fruit cocktail glasses -- Page 2. Use chilled orange juice over prepared grapefruit for those who do not like liquor in cocktails. Serve the fruit cocktail as the first course of a dinner with, or without, some kind of appetizer. Boil these ingredients for one-half hour. Season them well and strain and chill them. Note: Good tomato cocktail may be bought bottled or canned. Season bottled clam broth with salt, paprika, horseradish, and a few drops of Tobasco Sauce, or a little lemon juice. 1 can crabmeat (6 1/2 oz.) flaked. Pour seasoned Sherry over the oysters 15 minutes before serving them. If cooking Sherry is used, omit the salt. Pare chilled grapefruit and skin the sections. Place the sections (intact if you can keep them so) in cocktail glasses. Fifteen minutes before serving the cocktail sprinkle the fruit with powdered sugar. Immediately before serving it, add a tablespoon of Sherry to each glass, or fill it three-fourths full with chilled orange juice. Chill the fruit, cut it crosswise and loosen the pulp from the peel with a sharp knife. Remove the seeds and cut out the tough fibrous center with a pair of scissors, or a patent cutter. Sprinkle the fruit with sugar and set it aside for 15 minutes. Add 1 tablespoon of sweet Sherry to each half just before serving the fruit. Prepare grapefruit as for grapefruit cocktail, omitting the sugar. Place several small oysters in each center and season them with lemon, salt, horseradish, Tobasco Sauce, or with Sherry. (Omit the salt if cooking Sherry is used). Prepare grapefruit as for grapefruit cocktail, but instead of sprinkling it with sugar, season it with salt and paprika. Fill each center with three or four shrimp that have been moistened with French dressing. Serve the grapefruit garnished with a sprig of parsley. Use combinations of fresh fruits sliced, sugared and chilled. Flavor them with lime juice, lemon juice, or Sherry. Seedless grapes, watermelon, green and yellow cantaloupes (cut into balls with a French potato cutter), Queen Ann cherries (stoned and stuffed with filberts) and fresh pineapple make good cocktails. Chilled ginger ale may be poured over the fruit immediately before serving it. Peel and dice a fresh pineapple. Make a syrup of 3/4 cup of sugar and I cup of water. Pour this over the fruit and chill it for several hours. Shortly before serving the pineapple sprinkle it with chopped mint leaves. Trim two-thirds from the leafy top of a chilled pineapple and cut the fruit into six or eight lengthwise parts. Cut off the core and place each part so that it will resemble a boat. Pare the skin in one piece, leaving it in place and cut the pulp into five or six downward slices -- retaining the boat shape. Serve each boat on an individual plate with a small mound of powdered sugar and a few large, unhulled strawberries. Cut the melon in sections. Remove the rind. Serve the peeled sections on lettuce leaves with lime or lemon juice, or with French dressing. Place large strawberries (hulled or unhulled) on lettuce leaves and moisten them with French dressing to which a little sugar has been added. Cut the pineapple into pieces, divide the oranges into sections and remove skins. Crush the mints and combine them with the other ingredients. Chill the fruit for one hour or more. Serve it with a sprinkling of powdered sugar. Follow the recipe for Creamed Oysters on Page 76. Place the pan containing the oysters over hot water. Toast small rounds of bread, butter them lightly and put on each round a creamed oyster sprinkled with chopped parsley. Place one large oyster, or three small oysters, on a round of lightly buttered toast and cover it with a thin strip of bacon. Place the canapes on a broiler and broil them until the oysters begin to curl. Surround shrimps, oysters or stuffed olives with small strips of bacon and secure them with toothpicks. Broil them quickly. Combine the crabmeat, peppers and the pimento. Make a cream sauce of the butter, flour and cream, season it and add it while hot to the above ingredients. Mix them well and place them on pieces of toast. Sprinkle the tops with grated cheese and heat the canapés on a broiler or in a hot oven until the cheese browns. (If the approval of guests is to be taken as a criterion of excellence, this is the prize winning Canapé). Roll pie crust -- Page 209, until it is very thin. Trim it into an oblong about four inches wide. Spread the surface with a filling and roll the dough like a jelly roll. Chill the rolls, cut them in half inch slices and bake them on a greased pan in a quick oven. 1. An equal amount of cream cheese and anchovy paste, or deviled ham. 2. Grated American cheese seasoned with cayenne. 3. Cottage cheese, or cream cheese, seasoned with salt and paprika. For canapés, spread one of the four following fillings between trimmed slices of bread -- cut the slices into small attractive shapes or roll them and secure the rolls with toothpicks. For sandwiches, serve more generous portions. These canapés may be prepared in advance, if wrapped in a damp cloth, or in waxed paper, until toasted. They must be toasted on both sides immediately before they are served. Spread the filling between thin layers of white bread. Spread sautéd and creamed mushrooms, well minced and seasoned between thin layers of bread. See Page 123 for preparing mushrooms. Thin Braunschweiger sausage with canned tomato soup and a little cream until it is a good consistency to spread. Spread it between layers of dark, or light bread. Stir these ingredients into a smooth paste. Remove the crusts from a loaf of bread and cut it into lengthwise 1/4 inch slices. Butter the slices lightly and spread them with the cheese mixture. Roll them lengthwise like a jelly roll. Wrap them firmly in a damp cloth and chill them for several hours. Cut the rolls into thin slices and toast them on both sides. Place slices of tomatoes on rounds of buttered toast. Season them with salt, paprika and a little mustard. Cover them with grated cheese and place the canapés in a pan in a moderate oven -- 375° -- until the cheese is melted. Combine bread crumbs with mayonnaise, making a rather thick paste. Cut tomatoes in halves, season them and cover them with the paste. Place them in a buttered pan and broil them for ten minutes in a quick oven. Place thick slices of tomato on rounds of buttered toast. Season them and cover them with thin slices of bacon. Broil the canapés under a broiler until the bacon is crisp. Toast rounds of bread on one side. Spread the untoasted sides with peanut butter, cover them with very thin strips of bacon and broil them under a quick flame until the bacon is crisp. Roll link sausages in small squares of pastry dough. Bake them in a hot oven. Toast large rounds of bread on one side. Combine crabmeat with mayonnaise and place it on the untoasted side of the bread. Cover each canapé with a heavy coating of grated cheese. Place the canapés under a broiler until the cheese is melted. 1 tablespoon mayonnaise and Slice II. Slice III. is placed on top of Slice II. Use small crisp pretzels. Place soft, well seasoned cheese in the hollows and press the pretzels into rolled pretzel crumbs. Chill them until ready to serve them. Steam Swedish Wafers in a double boiler. When they are pliable, roll them into cornucopias. When they are stiff, fill them with a cheese or sandwich filling. Spread large pecan meats with Roquefort cheese that has been moistened with a few drops of lemon juice or cream. Press two halves together. Spread crisp potato chips with cream cheese or Roquefort cheese to which a dash of Worcestershire Sauce has been added, or spread the chips with cream cheese combined with fish paste. 1 package cream cheese and season this with salt. Fill dwarf celery ribs and sprinkle them with paprika. Rub a bowl with a clove of garlic. Put a small amount of olive oil in the bowl and toss the olives about in it until they are well covered with oil. Put the olives on ice until chilled, dust them with chopped parsley and serve them at once. Place a small dab of butter in the center of a crisp cheese cracker and next to it, or over it, a small dab of anchovy or sardelle paste. Place a slice of tomato on a round of toast and put one or two marinated shrimp in the center. Cover the shrimp with a dab of mayonnaise. Cut thick slices of tomato. Cover them with a mixture of caviar and the yolks of hard cooked eggs, chopped, seasoned with lemon juice. Garnish the slices with the whites of hard cooked eggs chopped, and serve them with a fresh shrimp in the center of each canapé. Sauté rounds of thin toast in butter, add finely chopped onion to caviar, spread it on the toast and garnish the edges of the canapés with the yolks of hard cooked eggs that have been put through a ricer. Serve the canapés with thin slices of lemon. Remove the crusts from a loaf of bread and cut it into lengthwise 1/4 inch slices. Spread the slices with a paste made of Roquefort or cream cheese, thinned with cream, colored pink with paprika. Roll each slice around a jumbo pickle. Wrap the rolls in waxed paper. Chill them well and when ready to serve them cut them into 1/4 inch slices. Moisten soft cream cheese with cream, season it with Worcestershire Sauce, finely chopped onion and paprika. Spread the cheese on very thin slices of smoked, boiled tongue, or on chipped beef (put up in glass) and roll the canapés. Spread thin slices of bread, from which the crusts have been cut, with a little butter and mayonnaise and sprinkle them lightly with chives. Place an asparagus tip at one end and roll the bread about it, or place well drained asparagus tips in French dressing for half an hour, drain them and use them as directed, omitting the mayonnaise. Wrap the rolls in waxed paper until ready to serve them. Chill cucumbers well, pare and slice them. Season them and place them between layers of bread spread with butter and mayonnaise. Serve them at once. Peel and cut tomatoes into thick slices. Sprinkle them with salt and place them between layers of bread spread with butter and mayonnaise. Chopped fried bacon may be added. Spread chopped pecans, moistened with mayonnaise, on thin slices of white bread and cover them with slices on which washed nasturtium leaves or nasturtium blossoms have been placed. Place the contents of a can of Tuna fish in a strainer and pour 2 cups of boiling water over it. Drain the fish well and chill it. Combine it with well seasoned mayonnaise and spread the mixture between layers of bread on which lettuce leaves have been placed. Combine these ingredients and moisten them with French dressing seasoned with onion or garlic. Combine the ingredients lightly, using a fork. Garnish the sandwiches with stuffed olives. Garnish the sandwiches with salted almonds. Enough butter, mayonnaise or French dressing to make the filling a good consistency to spread. Season hard cooked, chopped eggs and make them into a paste with a little cream and a few drops of Worcestershire Sauce Add fried, chopped bacon and spread the filling between thin layers of bread. Cut rounds of bread and spread them with cream cheese. Cover each piece with a thin slice of pineapple and garnish it with a maraschino cherry. Grind these ingredients and season them with salt, pepper and mustard, moisten them with vinegar until they are a good consistency to spread. Copyright &copy; 1931 by Simon &amp; Schuster Inc.